Healthy eating made easy and convenient, including your favorite foods! Healthy and delicious recipes with over 50 photos! Managing fat and cholesterol in today's diet doesn't mean cutting out your favorite foods. 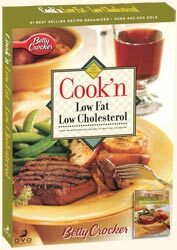 Cook'n Low Fat Low Cholesterol contains over 120 healthy and delicous recipes, plus photos from Betty Crocker's Low Fat, Low Cholesterol Cookbook. Cook'n Low Fat Low Cholesterol is all about eating well, which means eating foods that are good for you and, even more importantly, enjoying what you eat. Just about everyone recognizes that healthy eating is a good idea, yet in a survey conducted by the American Diatetic Association, less than half of Americans felt that they were doing all they could to eat well. 1. A fear of having to give up favorite foods. 2. It takes too much time. 3. Information on health is contradictory. Forget your fears! 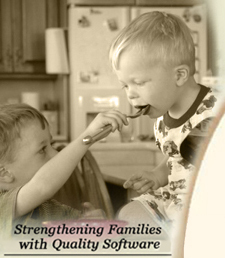 Healthy eating can be easy and convenient, and it can include your favorite foods. Cook'n Low Fat Low Cholesterol connects the dots between good taste, good food and good nutrition. 120 recipes, photos, instructions, and more!